Kick off Registration Opening Day at the Cheesy Teaser! On Wednesday, May 1, Toasty Cheese and Cupcakes for Courage will pop up on campus to provide a glimpse of the glory that is a food truck rally. 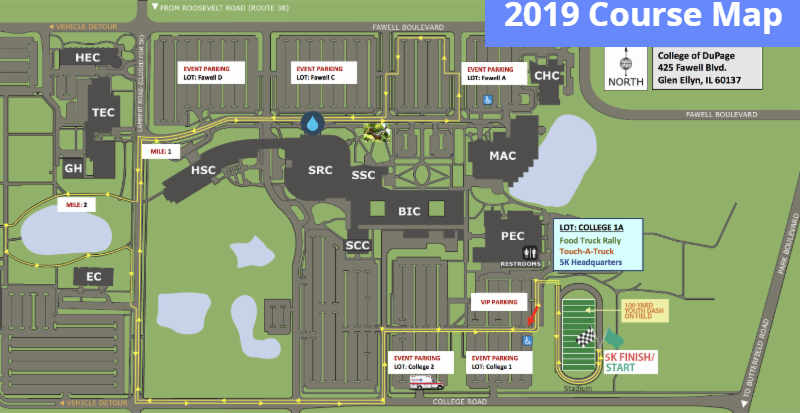 Find the trucks at the north entrance of the Student Resource Center from 11:30 a.m. to 1 p.m.
No need to register for the 5K or Youth Dash to enjoy the Cheesy Teaser May 1 or the event on Saturday, October 5. However, you *should* take advantage of the Early Bird fees before it's too late! Early Bird fees beginning May 1 are $15 for only the first 500 participants and special prices for staff, faculty, and alumni. Opportunities to win Food Truck Rally vouchers during early packet pickups! So where do the proceeds go? Student scholarships, of course! Each of the 15 high school districts served by COD has a dedicated scholarship for their graduates who choose to attend COD. When you register for either the 5K Run/Walk or the 100-Yard Youth Dash, designate your race fee to the high school district of your choice. Scholarship applications for each high school district are open through Friday, May 31! If you know a 2019 graduate with a 3.0 GPA, please inform them of this great opportunity to receive $500 toward tuition and/or books. Applicants must have COD student identification numbers to apply for the scholarship. View scholarship information and create a profile. A delicious lineup of 15+ award-winning Food Trucks! Score $10 in Food Truck Rally vouchers! Follow us on Facebook or sign up for infrequent emails and be entered into a weekly drawing to receive $10 in vouchers for the Food Truck Rally! Those who already follow the event on Facebook will be eligible for the drawing (excluding previous winners). Winners will be notified via email or Facebook messenger depending on how they entered the drawing. Valid only for those 18 and older. Gift cards (i.e. vouchers) may be considered taxable income for COD employees. No award substitutions or cash equivalents. Join thousands of your closest friends on Saturday, October 13, 2018 at College of DuPage's Food Truck Rally and 8th annual Sunset 5K Run/Walk. This is a not-to-be-missed west suburban event featuring more than 15 sought-after food trucks, a robust Touch-A-Truck for kids of all ages, and a perfectly paved 5K course on a gorgeous fall day.